I made roasted chicken rice for lunch. It's been a while since we last had something sinful.... I adapted the roasted chicken recipe from Angie of Seasaltwithfood. It's a little tedious, if you ask me because thee are so many sauces to make to accompany it. Aaron really likes the homemade dark soy sauce over his rice but I absolutely adore the ginger and spring onion dip. I ended up making the garlic chili sauce as well. So 3 types of condiments, cucumbers and corianders as garnishes. And the rice...I cannot stress enough how important it is to get chicken with fats. Throw the fat trimmings into the rice and indulge....They say the yummiest food often is the most unhealthy one and I truly agree. I don't do this often so it is fine. We had an awesome lunch and saved some for dinner and we're still not sick of it. Minus all the condiments, this is rather easy to make. You marinade the chicken and bake it and cook the rice with chicken broth and fat trimmings. You can chop up some cucumbers and coriander and also tomatoes if you like while the rice is cooking and the chicken is roasting. 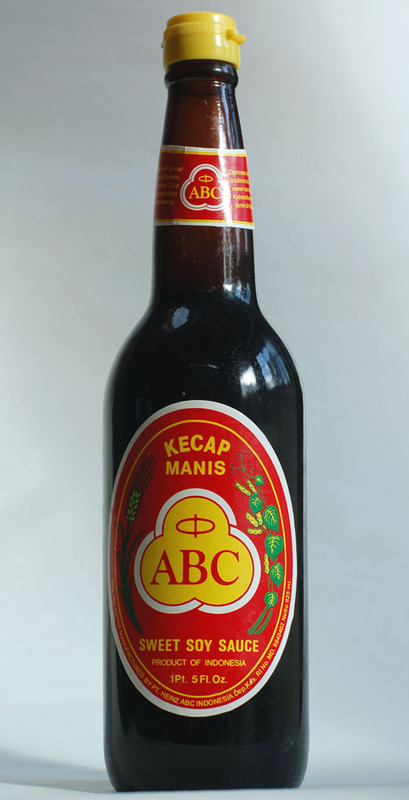 Use store bought Kecap Manis and Chili Sauce and just make the ginger spring onion dip if you wish to. Bu I'm just more into making things from scratch because I'm pretty picky. So is Aaron. They're often too sweet or not spicy enough or not garlicky enough. And they could easily be made using cheap stuffs, why bother buying really. If you're cooking for plenty, this is really, very worth making! I do have habits of making chicken broth and storing them in my freezer because they come in so handy when I wanna make Soto Ayam or just simple chicken noodle soup. Like what Angie said, I sometimes add tofu cubes and Wakame seadweed to the soup. Else if left plain, a handful of fried shallots, finely shredded lettuce and a shake of pepper is good enough. All in all, there is many ways you can eat these. Thanks Angie for sharing such wonderfully roasted chicken recipe. They're so easy and your friends would have thought you've slaved over the BBQ pit for hours! Marinate the chicken all the ingredients for 30 minutes. Keep in fridge while you preheat the oven to 200˚C. Drain the chicken and roast in the oven for about 45 minutes or until the chicken is fully cooked and evenly browned all over. Bring all the above to boil and simmer, covered for approximately an hour to 90mins. Skim the surface at the beginning until no foams are visible, only clear liquid stock. Set aside and use it to cook the rice and the following sauces. Depending on how much fat trimmings you obtain, add a little oil if necessary into a pan and heat it up. Add in the the chicken fat and when they are rendering, toss in the ginger, garlic and shallots. Stir fry them until fragrant and garlic start turning a light brown colour. Toss in the drained rice and salt and stir to coat well and stir fry for a while to let flavour mingle a bit. Pour everything back into the rice cooker and add enough chicken stock to cook it. Throw in the pandan leaves and let the rice cooker do the cooking whilst you get along and do the condiments. Process everything above until smooth and set aside. If you have a mortar and pestle, pound it first before processing and adding all the liquids. Pour them out on a dipping dish and set aside. Rinse your food processor and get ready for the next dipping sauce! Process the ginger and spring onion until very fine. Tip them out into a heat resistant dipping saucer. Heat up the oil and when they are smoking, pour them into the ginger mixture. It will sizzle so step back. Stir to coat around. The oil will turn to a light shade of greenish like. Set aside. 1/2 tbsp oil or chicken fats if you have a lot to spare an are not worry about the cholesterol! Heat the oil or chicken fats in a pan and add in the minced garlic. Saute for a while and add in the chicken stock. Bring to boil and boil it for 2 minutes or so. Add in the sugar and stir to dissolve. Thicken with the thickener. Depending on how thick you want them to be, you might not necessarily use all of them. Pour them out into a dipping dish and set aside. Woaah! You've got five stars chicken rice! It looks so good just like the restaurant one. No point to dine in the restaurant, you just make it so perfect! Hey Quinn, glad you like the roasted chicken and thanks for the link. Fyi, I just had chicken rice last weekend, as usual I ate too much! love the dark roasted skin - my fave part of roasted chicken. and the sauces are so delicious looking as well. Thanks everyone! Because here in Australi, getting good roasted chicken rice is tough, that's why have to make 5 star chicken rice at home! Angie, thank you so much for the recipe, it's amazingly easy and good! Noobcook: I know this sounds funny but no, I throw the skin to Aaron, I feel very disgusted to have to pop it in my mouth, laugh all you like! 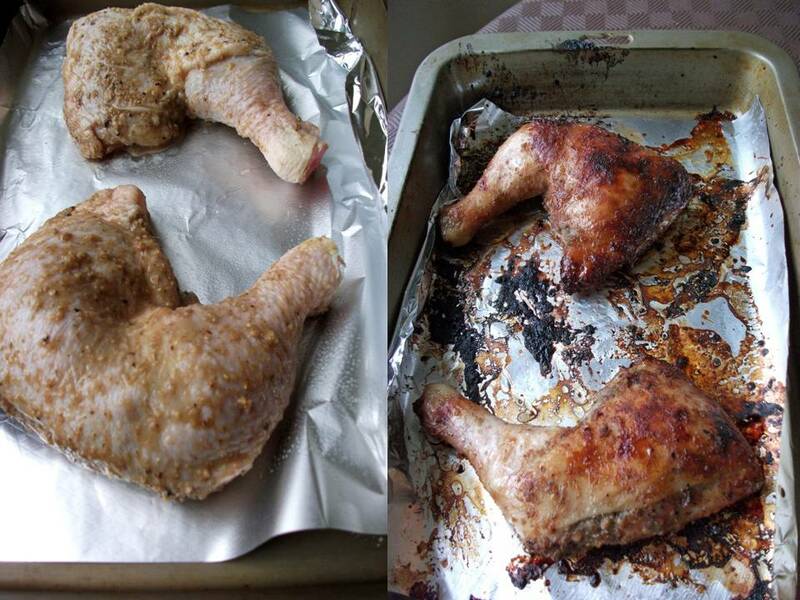 Turned on by the dark, crispy-looking skin and the simplicity of the chicken recipe, I had to give it a go. The chicken was very good; repeats aren't too far off! Thanks for posting such a beautiful, tempting and persuasive dish! The Cook: Thanks and I am so glad you like it. It's simple enough isn't it. The charred bits of your chicken is killing me too! You've got some great photos too, seriously. Thanks for willing to try some of the recipes here. People might blog because they're desperate or has good photos or for whatever reason but I blog about them because they're worth every mention.